A new study by an international team of scientists has found that outdoor air pollution kills 2.5 million people worldwide each year. According to BBC News, the researchers calculated the vast majority of the deaths, 2.1 million, were linked with fine particulate matter, with some 470,000 deaths from ozone. In addition to contributing to these deaths, outdoor air pollution increased "respiratory and heart disease risks, with the young, elderly and infirm most vulnerable." Other research has shown that indoor pollution, particularly in developing countries, causes another 2 million deaths annually. The researchers wrote: "Epidemiological studies have shown that PM2.5 (particulates with a diameter of less than 2.5 microns – about 30 times thinner than the width of a human hair) and ozone have significant influences on human health, including premature mortality." According to the U.S. Environmental Protection Agency (EPA), particulate matter is a "complex mixture of extremely small particles and liquid droplets. Particle pollution is made up of a number of components, including acids (such as nitrates and sulfates), organic chemicals, metals, and soil or dust particles." The EPA is most focused on particles 10 micrometers in diameter or smaller because "those are the particles that generally pass through the throat and nose and enter the lungs." Finer particles, which are 2.5 micrometers in diameter or smaller, are found in smoke and haze. Forest fires, residential fire places and wood stoves, agricultural burning, power plant emissions, and car exhaust pipes all release those particles. The researchers used mathematical models to derive their estimates. Interestingly, they found that their estimate was lower than previous ones. But this may have been because of their methodology: "Our methods likely underestimate the true burden of outdoor pollution because we have limited the evaluation to adults aged 30 and older." In the same BBC News article, the World Health Organization (WHO) stated it's difficult to calculate the world's most polluted areas because "many cities with high levels of air pollution do not have monitoring systems in place." Still, outdoor air pollution was seen to be very high in China and India's booming cities and in major urban areas in Latin America and Africa. Overall, the WHO stated that mortality rates in cities with higher levels of pollution are 15-20 percent more than in relatively cleaner cities. Indeed, a scary new study states that outdoor air pollution in China is decreasing the life span of an average Chinese by 5.5 years. In comparison, in the European Union, which has some of the world's most stringent air pollution standards, life expectancy is reduced by just 8.6 months because of fine particulate matter. 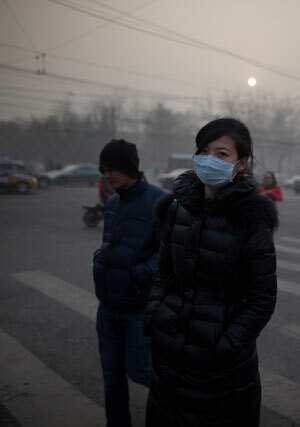 Climate change is also exacerbating the effects of bad air, contributing about 3,700 more deaths a year. As cities become even hotter in the summer, the air become even more dangerous. Interestingly, climate change may be changing the "biochemical characteristics" of plants, and not in a good way. "Trees use chemicals known as volatile organic compounds (VOCs) to attract pollinators as well as deter damaging attacks from insects and larger animals. However, higher temperatures can cause many tree species to emit more VOCs into the atmosphere, which reacts with sunlight to form ozone or more particulates." As a recent video from ASLA demonstrates, it's important to plant low-VOC trees in urban areas, along with dealing with power plant and car emissions. If done so, trees can actually aid in reducing air pollution because they help catch air particulates with their leaves. They also evapo-transpire and create shade, which cools the air. Learn more about the positive benefits of urban trees.